All Seasons Guest House has 4 rooms comprising of 2 small doubles, 1 family and 1 larger double. The larger double Room 2 can accommodate an extra bed or cot making it a family room for 3. The two small double rooms are very different. Room 1 is on the first floor which is en-suite and the second Room 3 is on the 2nd floor, this is not en-suite with the shower and toilet on the first floor. If you are travelling with children we have a snug Family en-suite room that sleeps a maximum of 4 on the 2nd floor and has everything you need to make your family break a special one. Breakfast is served between 8.45am - 9.30am every day apart from New Year. We souce local produce from local farmers and suppliers giving you an award winning breakfast to start your day. Enjoy a choice of a full Lakeland English breakfasts including vegetarian and other tasty options. We can accommodate most dietry requirements with prior notice. We also provide a buffet which includes Yoghurts, Fruits, Jams &Marmalade, Fruit juice and Cereal. The rooms in the guest house are NOT pet friendly. If you wish to bring your well-behaved furry friends we have rooms available in All Seasons Rest our sister accomodation, please view all our rooms below for both All Seasons Guest House &All Seasons Rest. Both of our pet friendly standard rooms are clearly marked. 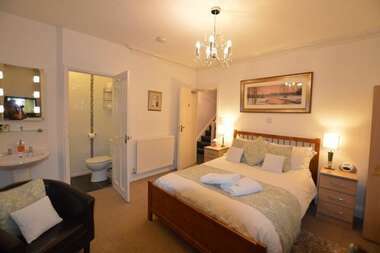 Private or en-suite shower with complimentry toiletries and fluffy towels. 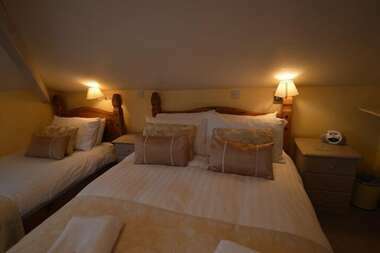 This larger en-suite room with King size bed is spacious with a small seating area within the room over looking the town of Windermere. Set at the front of the building with mountain views in the distance this room is modern with a TV and DVD player. The small en-suite has a shower and the room can accommodate and extra bed or a cot, which are priced individually . 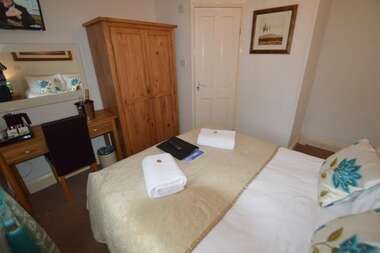 It has a comfy Divan double bed, shower, complimentary toiletries and bath sheets. -The room contains a TV/DVD player, double wardrobe and wash basin.- The private Shower room and Toilet are on the first floor, towels and robes provided. If you wish to bring your fury friends these rooms are perfect for you. 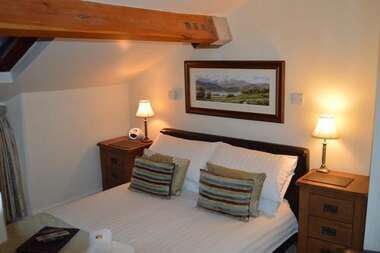 These comfy Standard Rooms are situated at the front of the building with views of the mountain tops and the town of Windermere. Both are in the Guest house. Room 4, snug second floor with 1 double bed and 2 single beds, low sloping ceilings.